Whether you are looking for industrial parts storage, factory parts storage, or any commercial parts storage solutions, Mustang Material Handling is capable of handling your requirements. Check out all the possible parts storage solutions below – we are able to provide a solution that works for your facility. We work with Rousseau for parts storage systems as our primary source. Rousseau Metal Inc. has been manufacturing high-quality products for 65 years. They have become known as a leader in storage solutions. The quality, durability and reliability of their products is among the best in the industry. 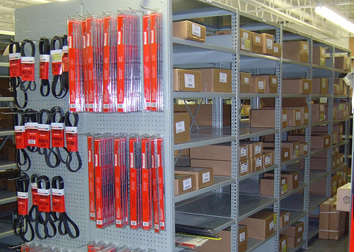 Not finding the parts storage system that is right for you? Please call us at + (330) 753-7225. Mustang Material Handling has a qualified team of skilled installers that are available to answer questions about a parts storage solution for your facility. Mustang Material Handling sells, services and installs parts storage and warehouse equipment for customers in the Akron, Canton, Toledo, Cleveland, Youngstown, Columbus & Dayton Ohio areas, and also in the Pittsburgh, PA region. For Machining shop, Assembly lines, Parts store, Maintenance and repair stations – there is a solution for your Manufacturing parts storage requirements. For warehouses, distribution centers, vehicle maintenance – there is a solution for your Distribution parts storage requirements. For deployment and containers, weapons and sensitive parts, boats and ships, maintenance – there is a solution for your Military and Security parts storage requirements. For records storage, service departments, training centers – there is a solution for your Government parts storage and records storgae requirements. For Sterile Processing Department, Central Sterile Supply, Biomedical Department, Central Store Room and Distribution Centre, Maintenance Department – there is a solution for your Hospital parts storage requirements. For Warehouse and Storeroom, Maintenance and Repair Shop, Industrial Vehicle Maintenance Department, Administrative Department- there is a solution for your Mining parts storage requirements.